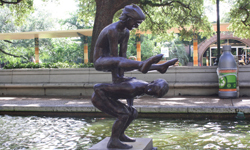 The work of Victor Salmones, the bronze sculpture Leapfrog was created in 1976. It was purchased by the Houston Fine Arts Council. 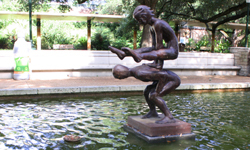 Showing two children at play, it is prominently displayed at the Houston Zoo Reflection Pond. In 2002, it was briefly removed from view for restoration. Victor Salmones (1937-1989) was born in Mexico City and, after a stint in commercial art, attended the Instituto de Bellas Artes. He opened a sculpture studio in Cuernavaca in 1966, and won several prestigious art prizes during the course of his career.